Inspire: Units you draw get Berserk. Nightfall - The first Nightfall card played in a turn makes it Night and extends it by a turn for each player. Night - When you start a turn at Night, draw an additional card and take 1 damage. Berserk - Units with Berserk can make a special double attack one time: If it survives the first round of battle, it will attack again. This can only be used once, and gives the unit Reckless. 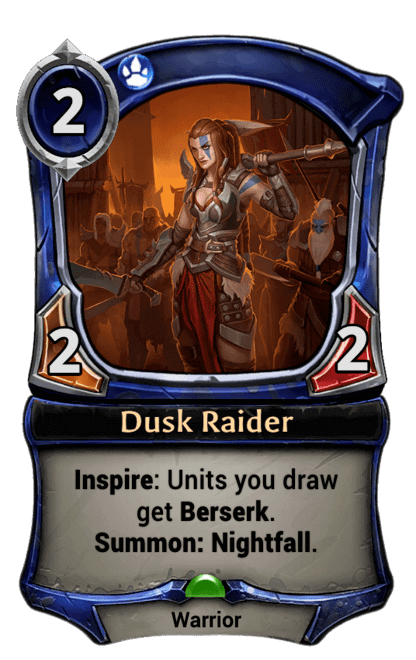 Inspire - Units with Inspire grant a bonus to other units you draw.